Birthday card designer software enables you to design and print birthday cards for your friends, relatives and other people on their birthday. 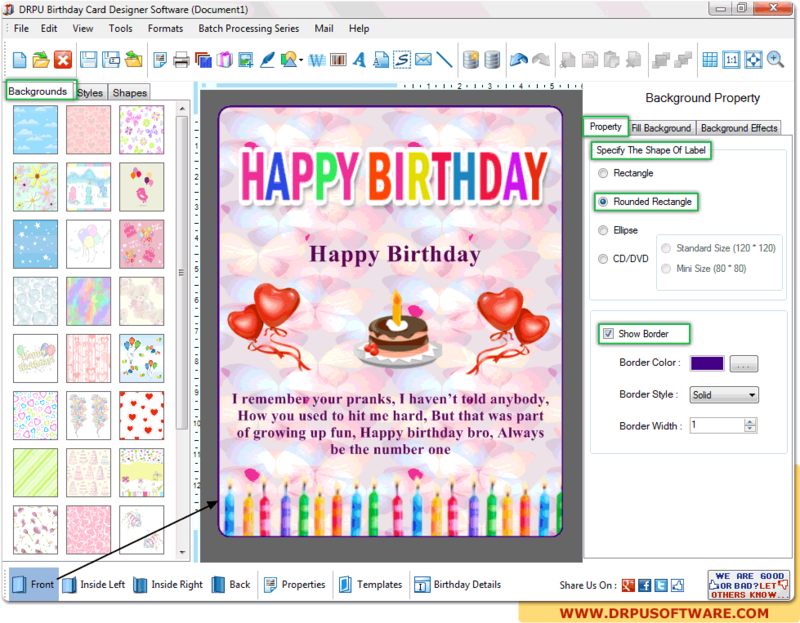 You can insert snaps, family photograph, image, clipart, logos while designing birthday card. Birthday cards designer software design and generate cards with use of image designing objects including Line, Ellipse, Pencil, Rectangle, Text, Picture, Arc, Triangle and Star objects. Birthday card designing software easily creates required cards in various shapes including rounded rectangle, ellipse and rectangle as per your need. Birthday card designer program makes birthday card in few simple steps. Birthday card Software designs attractive birthday invitation cards. Program allows you to send designed birthday invitation card on email using inbuilt email setting. Generate cards with use of different image designing objects. Software creates birthday cards in various shapes including rounded rectangle, ellipse, rectangle etc. Program provides option to take print of created birthday cards with advance print settings.